Synthetic ice rink is composed of plastics that are made of polymer materials, but the cost is only 1/5 to 1/3 times of real ice rink, low cost of maintenance, low energy consumption, due to its unmatched skating performance, ease of install, safety, durability and versatility, it is very suitable for the place of real ice, and can be vigorously promoted. Why Choose Our synthetic ice rink ? Our mobile ice rink is recommended for indoor and outdoor use and performs beautifully in extreme hot and cold temperatures, enhance your hockey or figure skating training for less cost. As with Huao synthetic ice rink, any hockey playing, skating, play floorball, training, and it can be laied in kindergarten, primary school, public place, personal place. 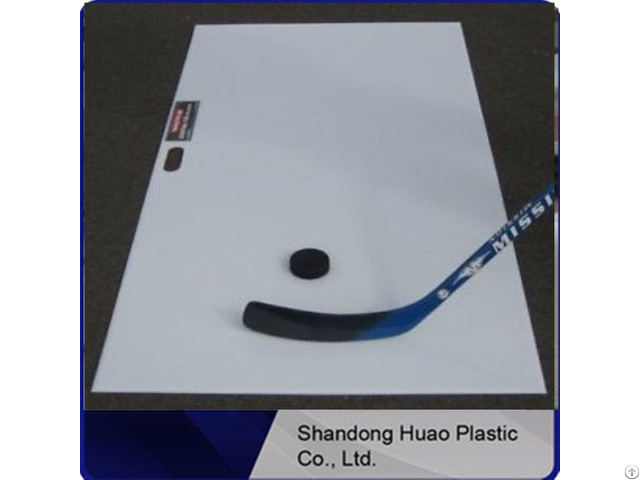 Our technology is one of the top of synthetic ice rink in China, and we can only sell our synthetic ice boards, we can take packaging services, and maybe you can be our agent tomorrow. What's Connect Style Of Our plastic sheet for ice rink ? Our mobile ice rink is offered the most popular DL dovetail contaction style which makes installation vand removal very quick and simple, use of the DL will allow for a wide variety of installation shapes to fit specific needs, and it can give you a safety glide environment. Business Description: we are a professional manufacturer for UHMWPE plastic sheet,HDPE plastic sheet and irregular parts with year's experience.